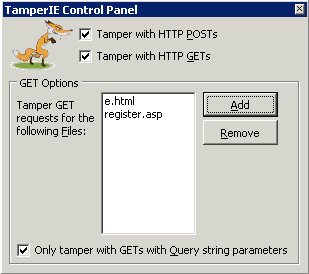 TamperIE is a simple Internet Explorer Browser Helper Object which allows lightweight tampering of HTTP requests from Internet Explorer 5 and above. WARNING: This tool makes it simple to do very bad things to poorly-written code. Malicious use of this tool against third-parties is a violation of federal, state, and local laws. Be smart. TamperIE works inside IE itself, before data is placed on the wire; this means that it works fine even against HTTPS-secured sites. Need more power? 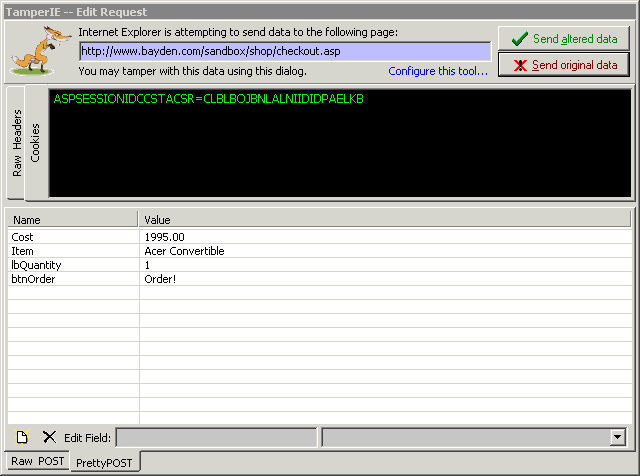 You might find the Fiddler HTTP Debugging Proxy more powerful, as it supports an automated scripting engine, and can modify any part of any request or response. You can learn more by viewing the TamperIE Tutorial.